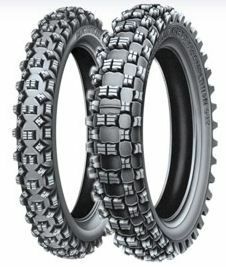 As I burn through tires on my Yamaha WR250R dual-sport, I will do my best to keep track of their tread-wear and characteristics here. As tires can last anywhere from a few months to the better part of a year, this section won't grow quickly, but it will grow. I will forewarn readers that I prefer cheaper tires, so reviews of the more popular yet pricey tires aren't going to be appearing here. If money is less an issue, I have heard great things about Dunlop D-606s ($180 per set) and Mefo Explorers ($275 per set), and would recommend looking into those options. For me, there are plenty of options to explore in the $120 and below range. The WR250R comes from the factory with a TW301 front and TW302 rear tire. These tires have a terrible reputation, to the point where many folks remove them immediately after purchasing the new bike. The previous owner of my bike did no such thing, so when I made the purchase, these tires where still mounted. At 3100 miles, there was plenty of meat left on them, although they were very flat spotted across the center. The previous owner most likely spent most of his time on straight pavement. Air pressure and riding conditions are all unknown for this tire because of the previous owner, so it will not be an accurate representation of my experiences.I will say, despite the poor reputation, I had success with this tire over the 1100 miles I put on it. Both on pavement (wet and dry) as well as in dirt, I was quite pleased with the traction. Keep in mind, this 1100 miles was also my 'getting to know this bike' time, so I was never pushing it very hard. 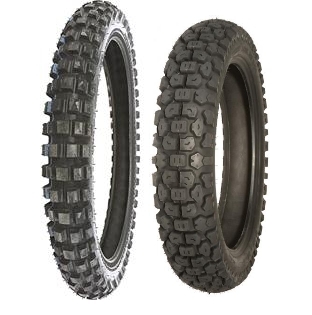 These tires are more focused towards street use, and they will not handle hard off road riding well. I swapped them perhaps a bit prematurely, mostly due to the flat-centered nature from the previous owner. The rear is just a hair above the wear bars; I'd guess there is close to 1000 miles of pavement left in it, but the center knobs are virtually useless. The front tire was in much better shape, but I opted to change it with the rear this time. New they run $143 per set, a bit more than I like to spend. The Shinko 244's come in at a low low $80 for the pair and have a fairly good reputation, so naturally they were my first choice for a replacement tire. 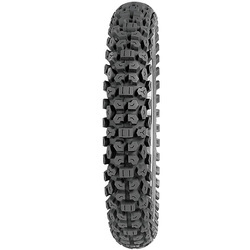 They are considered a 60-40 tire (60% street - 40% dirt), so they will not be the best tire if I find deep mud/sand. For the hard-packed dirt and gravel I most often find off pavement, they get the job done. 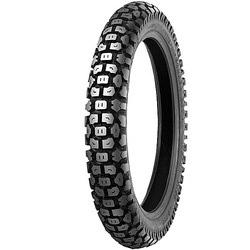 These tires are great on road and do well off-road in almost any condition. Their largest weakness is wet, hard mud/clay. In sticky mud they do pack up quickly, but they are still manageable. They are (obviously) not aggressive tires, and as such, lend themselves to more of the 'explorer' style riding, rather than any sort of race-pace riding. The rears last around 3000 miles, and the fronts will go triple that. 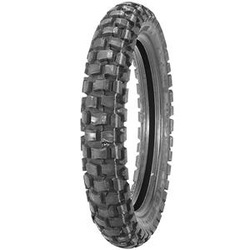 The Kenda K-270 is nearly identical to the Shinko 244, with the exception being a bit deeper tread. I went ahead and replaced my worn out rear Shinko with this Kenda, to see if I'd get a bit more mileage out of it. I left the same Shinko on the front. The tire wore very similarly to the Shinko, perhaps lasting just a bit longer (probably 500 miles longer), but the pavement traction was noticeably lower. I locked up the tire in aggressive braking several times. The tire never slipped while leaning, and worked about the same as the Shinko off-road, but I think I'll stick with the Shinko over these for my use. A half used set of these were graciously given to me to use up. They're far from my normal tire choices, as they are aggressive, short lived, and pricey, but I will gladly oblige. They're not going to be as stable on the pavement as my previous tires, but the soft compound should stick well regardless. As expected, these tires wore quickly and rode poorly on pavement. The traction was there (soft rubber compound), but they wiggled and shifted constantly, providing very little confidence. Surprisingly, I did not like them on gravel, they seemed to bounce around more, and have a much harder time holding a line. I aired them down substantially, but they are such a stiff tire, it didn't seem to help. If my riding was constantly mud, soft dirt, or loose rocks, perhaps I would like these more, for my riding though (50% backroads, 25% gravel roads, 25% other) these are not the tires for me. There was probably another 1000 miles of useable life left, but I pulled them for a new rear Shinko 244, and the used front Shinko 244. My attempt at a more aggressive yet still longer lasting set of tires, has led me to this combination. I've had very good luck with the Shinko 244 rear, so I am sticking with it. It is inexpensive, long lasting (relative), and works well in most situations. The Shinko 244 front became fairly easy to out-ride off-road when I picked up the pace, so I went looking for a proper upgrade. I was torn between two, the Michelin T63 and the IRC TR8 Battle Rally. I tried the T63 on my KTM Adventure, and was very pleased. But... the IRC TR8 looks a bit more aggressive and was slightly less expensive, so I opted to try it on my WR250R. I hope, after this experience, I'll be able to make a decision as to which is the best (even though I'm testing them on two very different bikes). This tire combination kept me under the $100 mark, and I hope to still get around 3000 miles out of it.